Welcome back to our Game In Progress review of Final Fantasy XV. In this last installment, Patrick Lee reaches the end of Noctis’ confused quest and looks beyond, to the dungeons hidden after the story’s conclusion and to Square’s plans to revisit and rebuild this messy epic. You can find all three parts of Patrick’s review here. If the story of Final Fantasy XV were described to you, such that you didn’t have to experience it firsthand, you could rightly claim such a story was not just good but classic. The tale of a spoiled prince cut off from his privileges, hardened and educated by a grueling journey, eventually returning to reclaim his throne—it’s the stuff of legends. Far from being too convoluted, Final Fantasy XV is no more tortuous than The Lion King. Its failure as a story—and ultimately it is a failure—is rooted in its delivery, not its content. Its few major story beats are never given sufficient time or space to feel truly meaningful, all of them being either smothered by distractions in the front half or burned off in a hurry in the back half. Even a compliment as backhanded as “a good story badly told” is too charitable for Final Fantasy XV, but it’s possible to imagine a version of this story that is as affecting as it clearly aspires to be. The conclusion of Noctis’ journey is delivered with teary-eyed sincerity and dignity that it hasn’t come close to earning, but it at least doesn’t just fall straightforwardly on its face. A wild and largely pointless eleventh-hour shakeup gets dropped on the plot like a big, absurd anvil just hours from the end of the game, and its head-spinning weirdness turns out to be an unexpectedly decent substitute for genuine, emotional storytelling. That and the game’s purring, theatrical psychopath of a villain gradually taking a larger role help the final couple of chapters clamber a tiny distance out of the hole the game has sunken into by that point. None of this is sufficient to correct the story’s terminal shortcomings, but it’s all much-needed evidence that Square Enix can still pull the odd rabbit out of their hat, even if that rabbit is insane with rabies and dying of myxomatosis. The story concluded and the battle won, Noctis and his chums are deposited back into the world, free now to explore the open roads of Lucis at their leisure. Throughout the game’s overbearingly linear second half, Noctis has always had the option to travel back in time to the open world with the help of a magical dog, a useful feature that isn’t quite as whimsical in practice as it sounds. It’s a small mercy to be able to escape the crushing misery of the final few chapters for a time-bending vacation, but it also undermines the game’s two-part structure, making every plot development past the halfway point feel temporary or unreal somehow. In any case, once the boys have traveled back to their comparatively carefree days, there isn’t much for them to do there besides continue completing the game’s 10 million side quests. After the credits roll, this freedom to return to the past becomes even more pointless. Not that it’s totally unenjoyable—returning to the lackadaisical rhythms of the game’s first few hours is a welcome change—it’s just that with the story concluded, any further adventuring is done purely for its own sake. Exploring some of the world’s optional dungeons offers a spark of intrigue, at least. One carefully hidden marathon of a dungeon in particular contains more unique ideas than every one of the bland mandatory dungeons combined. Like so much else in the game, it’s thrilling at first, but as the hours tick on, it becomes increasingly confounding. The vast majority of Final Fantasy XV’s levels offer nothing more dastardly than the occasional dead end and could have been greatly improved had this dungeon’s abundance of gimmicks been redistributed among the parts of the game you’re forced to experience. Why were all of the best level-design ideas packed into a single dungeon, then deliberately hidden? Questions like that are two for a penny in Final Fantasy XV. With its conga line of off-screen tragedies and its overripe ending, the game is clearly struggling to set a melancholic tone, but its emotional baseline ends up being confusion instead—a confusion so powerful that it often miraculously keeps frustration and disappointment at bay. After all, how can you remain disappointed in a game that introduces a half dozen major antagonists in one cutscene, then completely forgets about all but two of them? How can you stay angry at a game in which a main character’s tragic backstory is broached once, as an explanation for why he’s able to open a specific door, then dropped permanently without it altering the story or his relationship with the other characters? That disarming combination of weirdness and childlike incompetence ensures that the experience of playing Final Fantasy XV is rarely truly unpleasant, even while its myriad failures become increasingly obvious and distracting. “It’s finally over,” Noctis whimpers, after the last blow is struck, to which you might reasonably ask: “What do you mean ‘finally?’” Final Fantasy XV has been in such a rush to get to this moment that it doesn’t feel anything like the conclusion to an epic journey. As the voice of the game itself, though, it makes sense. After 10 years of preproduction, staff changes, and rebranding, development on Final Fantasy XV is finally over—except it isn’t. 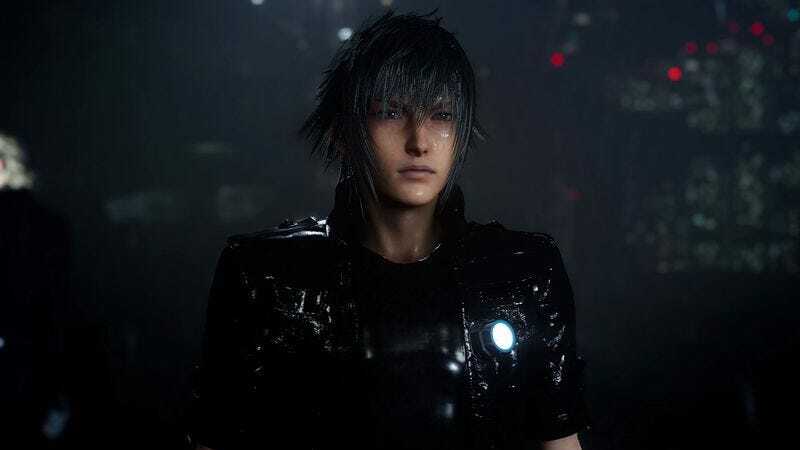 A slate of post-release downloadable content is upcoming, and director Hajime Tabata has already promised to beef up the story with additional cutscenes. It won’t help. Final Fantasy XV’s story has the potential to be strong enough, its characters are endearing enough, and its world is interesting enough that it could have been great. But it doesn’t fall short because it’s missing a few cutscenes. It falls short because it needed several more years of full-time development. It’s heartening that Tabata recognizes that his game needs improvements, but if its crippling underlying flaws aren’t addressed, throwing more crap on the pile will just result in an even more lopsided, slapdash mess. Purchase Final Fantasy XV here, which helps support The A.V. Club.